There are 5 posts tagged open badges (this is page 1 of 1). Fosdem is the place where you’ll find a Google engineer who as a “full time hobby” is lead developer for WorldForge an open source Massive Multiplayer Online game, or where you have a beer with a developer who has a hard time finding a job, because all the code he write has to have a free software license: “you don’t ask a vegan to have a little bit of meat do you?”. It probably is the world’s biggest free software conference: More than 5000 people show up yearly in Brussels, there is no fee to attend and there is no registration process. I really enjoy going because there are few other events that have this few barriers to attendance and to approaching the event the way you want to approach it. I like wondering around and thinking about how these are the people that actually keep the Internet working. Below some notes about the different talks that I attended (very little educational technology to be found, beware!). Robert Dewar from AdaCore had an interesting talk about how to use free software as a true commercial offering. There was no ideology in his talk but only a pure commercial perspective. They usually sell free software as “open source” and focus on convenience and utility in their selling proposition. They tell the customer they get the source code included without locks and with no limits on the number of installs. The business model is based around subscriptions (for support, testing, etc.). What he really likes about that model is that the interests of them and the customer are fully aligned: they only make money when the customer renews. Often companies have to get used to asking for support though, they have not been “trained” to value support in the past. He considers commercial versus open source a bogus distinction. In many ways he would consider AdaCore to be very similar to what Microsoft in what they do. The main difference is the license of the software. The AdaCore is much more permissive as you are allowed to copy and do with it what you want. He also spent some time thinking about whether AdaCore’s approach would work with other companies. Could Microsoft open source Windows? He thinks they could without it affecting them badly: people would be willing to pay for timely updates and support. Could a games company open source their games? Copryright protection is one way they currently protect their very large investments. 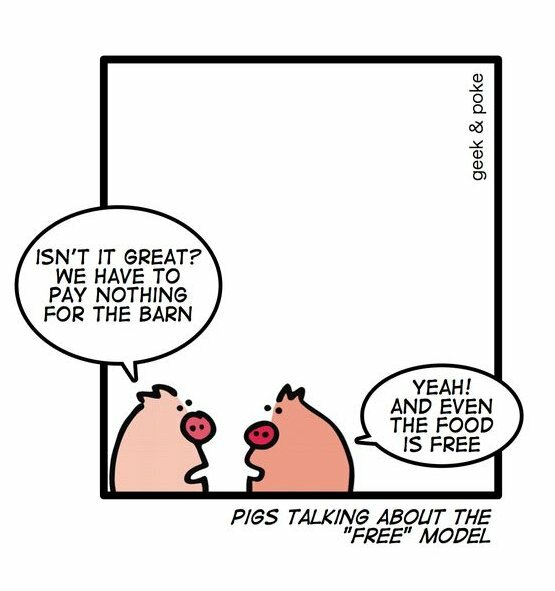 It might be hard for them to open source, but in general the model could be used much more widely. Every company is in the business of giving users what they want and open source licenses are that much more convenient for users. Simon Phipps has joined the board of the Open Rights Group and the Open Source Initiative (OSI). He talked about reptiles: they have no morality and are very old and only react to fear and hunger. Corporates are reptiles too. Corporations don’t have ethics, people have ethics. OSI tried to find a way to show large organizations that the four software freedoms (use, study, modify and distribute) are important for them too. A pragmatic rather than a moral perspective on open source software helped the OSI to be able to get corporate involvement. Their initial focus was very much on licensing. They have been succesful: OSI has become the standard for open source in government and the fear around the term has been turned around: other processes are now appropriating the term. We are now in a new decade: Open Source is the default and digital liberty is moving to centre stage. OSI has lost some of its relevance, so they decided to reinvigorate the organization with a member-based governance which should include all stakeholders. They now have new affiliates (other open source non-profits like Mozilla or Drupal) and the next stage will be government bodies and non-entities (whatever that might mean). Later they will get personal associates and then corporate patrons. All of this should enable a bottom-up governance. Members will decide how OSI will operate, they will create OSI initiatives, they can use OSI as a policy venue and they will co-ordinate initiatives locally and globally. A new OSI project will try and help educators educate the world about open source: FLOSSBOK. I am personally not sure the world is waiting for another project like this. There are quite a few alternatives already. App Stores have good sides (app discovery and monetization), but also very bad sides: they create vendor lock-in and prevent people from switching platform (I have personally felt this when contemplating switching away from the iOS platform) and occasionally inhibit free speech through “censorship”. Mozilla believes you can get the good of the app stores without the bad. Newer devices (tablets, smartphones and netbooks) are increasingly convenient and popular. Very often they force users to a specific browser (e.g. Chrome on the Chromebook or Safari on iOS) making them definition the opposite of the web. They are trying to solve identity in a decentralized, browser agnostic and privacy respecting way. The codename for the project is BrowserID and it is based on using email addresses to provide identity. Boot2Gecko (B2G) is a complete operating system build for the open web. Check out the Frequently Asked Questions about the project. In my book these three projects (especially the last one) make Mozilla a group of absolute heroes. Donate here! There was an interesting talk about how Mozilla organizes its own IT services. Currently that is done by paid staff, but they strongly believe they can get this done through the community (MediaWiki does something similar. Kai Engert talked about a very important topic: “Web security, and how to prevent the next DigiNotar“. He has a let’s say “unconventional” presentation style: instead of slides he used a piece of written text that he displayed on the screen and read out loud. Maybe this should be called something like “live visual podcasting”. His points were good though. He explained how it is a problem that every Certificate Authority (CA) has unlimited power and he listed the alternatives. You could maybe use a web of trust like the CAcert community. This still doesn’t solve the problem of a single root key. Another proposed solution was Convergence using notaries that would monitor certificates. Kai see too many problems with this as a solution for general users. One suggestion could be build on top of DNSSEC. Again that has problems. How do you know who has signed the the DNS? Google has also proposed something called Certificate Transparency which might work, but also might create some problems. His proposed solution builds on what is in existence using the existings CA combined wit the notary system. This talk was bit dense (I got lost half way if I am honest, obsessibely reading Megan Amram), so if you want to read it yourself find it here. Hackasaurus let’s anybody edit the web. Kids are suddenly empowered to remix existing web pages. Check out the hacktivity kit if you want to use this in the classroom. Popcorn.js is a HTLM5 media framework that allows you to connect web content with video. OpenNews (formerly called knight-mozilla) puts web developers in newsrooms building tools that help journalistic challenges. One thing I noticed is that she used htmlpad to present a few slides. I need to check this out as it is probably one of the simplest ways of collaborating around text or getting a quick HTML page online. The focus for Mozilla in Fosdem is very much on the technology side of things and less on the broader themes that the Mozilla foundation is tackling. I had a hard time finding somebody from the Mozilla Learning team to talk about Open Badges, but did get some good connections to have this conversation later in the year. Wikiotics did a very short lightning talk of which I only managed to catch the tail end. Their goal is to make a site that allows anybody to create, update, remix interactive language lessons. The Pandora is a small Nintendo DS sized open Linux computer designed for gaming. It has a 800×480 touchscreen, wifi, bluetooth, two SDHC card slots, SVideo output, two analogue controllers, a DPad, L/R buttons, a QWERTY thumb keyboard, 256/512MB RAM and 512MB NAND Storage. It has about 10 hours of battery life (full use). It comes with its own repository (an app store) allowing for easy installation and updating of games and other applications. One thing that will appeal to many people is the amount of emulators that it can run. If you want to relive the days you spent on the Amiga 500, Commodora 64, Apple II or the Atari ST it will work for you. Because the device is so open, the possibilities are limitless. For example, you could connect a keyboard and mouse using a USB hub and connect it to a TV to turn the Pandora into a small desktop PC or connect a USB harddisk and turn it into a web- or fileserver. The price price will be €375 (ex VAT). What is great is that the device is produced in Germany and so does not have any sick labour conditions for the people building it. Balance problems can occur in many places (e.g. map balance, cross scenario balance, unit characteristics) and aren’t easy to find. One way of finding them is by organizing tournaments as people will do their best to exploit balance weaknesses to win. Balance will always be a moving target and new strategies will appear. User feedback is not so useful because players think they never make mistakes and that all their strategies should work. Sometimes you can find some good providers of feedback: “These persons are important, and like all of us, they are fueled by ego. Don’t forget to fuel them”. His recommendation is to find somebody in your game’s community who can make a balance a fulltime job. Freedom Box: Out of the Box! Bdale Garbee, gave us an update on the activities at the FreedomBox Foundation. According to him it really is a problem that we are willfully hand over a lot of personal data to companies to manage on our behalf without thinking much about the consequences. Regardless of the intention of companies, for-profit companies have to operate within the rules of the jurisdictions that they operate and can lead to things like Photo DNA. Freedombox’ vision is to create a personal server running a free software operating system and applications designed to create and preserve personal privacy that should run on cheap, power-efficient plug computers that people can install in their own homes. That will then be a platform on which privacy-respecting federated alternatives to current social networks can be build. These devices will probably be mesh-networked to augment or replace the current infrastructure. They have had to bound the challenge by focusing on software, rather than custom hardware and on servers and services rather than client devices. They have also decided to use existing networking infrastructure where appropriate while working to move away from central infrastructure control points (like the Domain Name System (DNS)). Another decision has been to build all elements of their reference implementation on top of Debian which is a completely open volunteer based International organisation. This means that regardless of how successful they will be as a foundation all of their work will survive and remain available. Their goal is that new stable releases of Debian should have everything needed to create FreedomBoxes “out of the box”. The first “application” they want to deliver is a secure chat service. They have based this on XMPP with Prosody on a single host (by chance I was sitting next to one of the Prosody developers). They have also decided to make OpenPGP (GnuPG) keys as the root of trust. It is great technology, but it is hard to establish initial trust relationships. One interesting idea is to take advantage of smartphone technology (that we all walk around with) to facilitate initial key exchange (see the work from Stefano Maffuli). They have done some investigations into plug computers. They focused mostly on the Dreamplug (which gave them quite a bit of GPL related headaches), but you also have the Sheeva and the Tonido. There is an overarching trend at Fosdem that I could already see last year: the idea of decentralisised, distributed and federated systems for social networking and collaboration. There is a whole set of people working on creating social networks without a center (e.g. BuddyCloud or Status.net or distributed filesystems (like OpenAFS), alternatives to GoogleDocs (LibreDocs) and mesh networking (like Village Telco with the Mesh Potato). There are even people who are trying to separate cloud storage from the cloud application (Project Unhosted). These are very important project that have my full attention. If you have reached this far in the post and still want to read more (with a little bit more of a learning perspective) then you should check out Bert De Coutere’s blogpost. Through him I learned about Open Advice, an interesting approach to capturing lessons learned.